Comfortable headphones that won’t drop! With its Duofol diaphragms technology integrated, similarly to Sennheiser PC 350, the Sennheiser PMX200 brings strong sound reproduction. 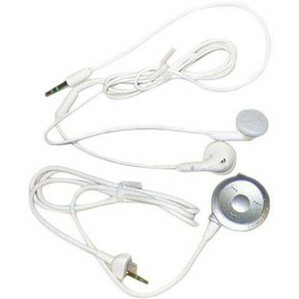 No sound leakage was experienced when using the device so that persons around the listener are not disturbed in any way. They also provide a clear sound, with no distortions. As they come with a closed design, they can become quite uncomfortable during hot seasons and thus impossible to wear. This also makes them impossible to use when you plan to exercise at the same time. Besides that, the bass is not working amazingly well, but this is usual with such products, so for the price one pays, the quality is ok. The Sennheiser PMX 200 device meets the expectations one has when it comes to this manufacturer. The design is very modern and comfortable at the same time, the headphones being perfect to wear on many occasions. As for the sound quality, it is not poor, nor perfect, but it provides the needed standards for common users. 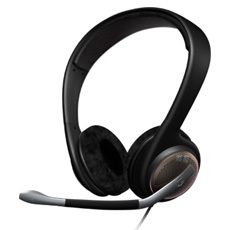 Sennheiser PMX 200 is compatible with portable devices and game consoles! This product uses the latest neodymium magnets technology, together with the effective TWIN sound attenuation system, which makes it a must have for the common user. In terms of design, Sennheiser PMX 200 headphones come with the option of replacing the ear pads in case they deteriorate in time. 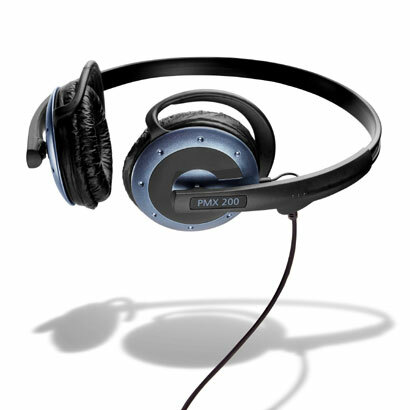 PMX 200 headset provides the perfect balance to listeners. The only problems that one can find with these headsets refer to the bass levels and the volume controller, but these are not big issues to deal with. 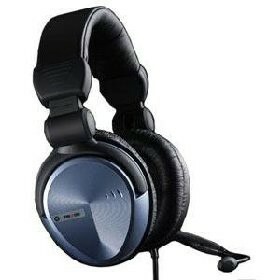 The headset provides great sound quality with quick response which is ideal for gaming. The microphone is enabled with sound-canceling features, which ensures that environmental noise is not delivered to whoever the user is contacting. The USB adapter has a built-in sound card. The volume is a bit low for some types of audio such as music, which is a problem that cannot be fixed. This is the perfect gaming headphone to be used to play online PC games or even for making Voice over Internet Protocol calls. Thanks to the simple USB interface, the headset is ready-to-go as soon as it is plugged in. The microphone of the headset is enabled with sound-canceling features, which means that your fellow gamers will hear you loud and clear. Sennheiser is generally known to develop the best whenever they make an attempt at delivering a piece of audio equipment. The Sennheiser PC 166 upholds this promise by being one of the most innovative and useful PC headsets out there. You may use it for gaming, music, or Internet telephony, but no matter what you use it for, it will deliver to your expectations. The Sennheiser PC 166 is built in a robust manner with a plastic headband and microphone arm. The open-backed ear cups are heavily padded for added comfort. A single cable leads to the headphone for connectivity. The USB connector with which you can connect your headset to the PC is enabled with a USB sound card as well, which is a truly amazing innovation, as with the Sennheiser PC 166 you can carry your sound settings around with you, meaning that you will never have any problem listening to audio no matter what computer you plug the headset into. The Sennheiser PC 166 provides great sound quality that is hard to beat. Gaming sounds will reach your ears with perfect authenticity and will impress you with their absolute power and hefty bass, treble and mid ranges. The microphone is enabled with noise-canceling, which means your voice will reach your fellow gamers and callers with perfect clarity, unhindered by environmental noise. The Sennheiser PC 166 is the perfect solution for online gamers, and for all other users who listen to any other form of audio on their computers. Save money and enjoy sound quality and comfort with Sennheiser HD201! As with the other headphones presented on the market by Sennheiser, the Sennheiser HD 201 headsets are very effective when compared to their price. Their main pluses are the comfort levels and the sound, as well as their vintage design, which makes them look very special. While the sound is perfect in general, it seems they leak some sound at times and the bass is weaker than with other such devices. This makes the Sennheiser HD201 headphones great for gaming and watching movies, but improper for listening to music, especially when one likes a great bass. The Sennheiser HD201 headphones are closed dynamic headphones that make an ideal choice for entering the world of quality sound. The headset has a great cost – quality advantage due to being well built, very comfortable and to the fact that its isolation feature is of quality as well. Get this headset for watching movies and playing games! All the other Sennheiser HD201 reviews describe how great the product is when compared to the price one has to pay for it. While these headphones are not suitable for DJs or other such professional domains, especially as their bass levels are quite low, they make a great choice for home users. The Sennheiser HD 201 device comes with a 3 meters long copper cable, which can be both considered to be an advantage and a disadvantage. While it provides a lot of freedom and mobility, the long cord can be annoying as well. 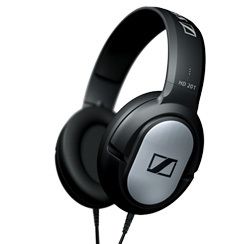 The powerful sound that Sennheiser HD 201 headset provides is very clear and with few distortions. Although for more money, higher quality can be found, this product is a good choice for those not willing to pay a lot for the headphones they use. Wireless signal connection for cord free and uninterruptible sound transmission. 24 ft. wireless range from the headset to the transmitter. Rechargeable battery that recharges when placed on the transmitter which acts as a dock. 90 degree transmission angle for flexible operation in any room. Some users have reported some hiss and static type noises, but this has not been confirmed as an outstanding issue. As with all rechargeable batteries, they become worn over time and begin to lose charge. These headphones are reasonably priced but lack in a range for operation, therefore it is given a 3.5 rating. The Sony MDR-IF240RK infrared wireless headphones are perfect for many different situations. Unlike conventional wireless radio signals infrared cannot be interrupted by electrical or magnetic interference. However, unlike wireless radio waves, infrared can also not pass through objects and walls. Infrared headphones must operate in open sight with no obstructions between the transmitter and the headphones. The Sony MDR-IF240RK headphones deliver crisp clear audio transmission through infrared transmission; allowing you to move freely about a room without worry of tangling or length. Perfect for listening to television late at night while others are sleeping. They are also very useful for working out and listening to your favorite music wirelessly. If you have ever tried working out with wired headphones you are likely aware of the complications involved in using them. When you find yourself looking for a good sounding and dependable source of listening to any kind of audio, make sure you remember how nice these Sony MDR-IF240RK infrared wireless headphones are. The optical and coaxial cables are very convenient for HD connections and computer sound cards. The sound is also overwhelmingly full and crisp. It amplifies minute sounds as well as intensives perceptible sounds. It also isolates ambient noise pretty well. The double-ear cups work well for dispersing noise. It feels good to hear sound not from just both ears, but from left to right and vice versa. The volume control of the headset lacks an automatic decibel equalizer to alternate between gaming and voice recognitions. In most cases, the overall gaming resonance is great. It’s only when you want to hear your voice or others is when it seems overwhelming. Also the Tritton True TRI-GA600 doesn’t really produce deep bass sounds. Instead it reproduces a rumbling effect (Rumble Headset Technology), which is tolerable in most cases, but nonetheless couldn’t replace a good ol’ “boom.” Last but not least, compared to most gaming headsets, it isn’t wireless. The Tritton True TRI-GA600 is great for PCs but works best with gaming consoles. It's only downfall is its inability to decipher gaming and voice recognitions. If you don’t mind the slight mishap when it comes to voice chat, the overall sound of the Tritton True TRI-GA600 is enough to warrant a buy. The Tritton True TRI-GA600 works well for both PC and gaming consoles. However, it really shines when it is used on a gaming console because in most cases sound cards output the same overall capacity when it comes to 5.1 digital audio, as compared to gaming consoles where they exert more freedom in alternating the sound according to the gaming experience. The one vice that could be considered a downside for the gamer is its inability to decipher gaming and voice recognitions. Because of the amplified Dolby Digital sound that the Tritton True TRI-GA600 provides, “voice chats” may be drowned out by the ambient sounds of the game. If you don’t mind the slight mishap when it comes to voice chat, the overall sound of the Tritton True TRI-GA600 is enough to warrant a buy.